Jasper, James M. 2019. Afterword: comparative versus historical research. Social Movement Studies, Vol. 18, Issue. 1, p. 130. Tremblay, Arjun 2019. Diversity in Decline?. p. 215. Jasper, James M. Young, Michael and Zuern, Elke 2018. Character work in social movements. Theory and Society, Vol. 47, Issue. 1, p. 113. Anthony, Constance G 2018. Schizophrenic Neocolonialism: Exporting the American Culture War on Sexuality to Africa. International Studies Perspectives, Vol. 19, Issue. 4, p. 289. Bob, Clifford 2018. 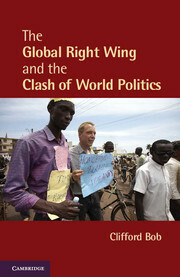 The Wiley Blackwell Companion to Social Movements. p. 115. Kaoma, Kapya 2018. Christianity, Globalization, and Protective Homophobia. p. 21. Stroup, Sarah S. and Wong, Wendy H. 2018. Authority, strategy, and influence: environmental INGOs in comparative perspective. Environmental Politics, Vol. 27, Issue. 6, p. 1101. Chaney, Paul 2018. Civil Society, ‘Traditional Values’ and LGBT Resistance to Heteronormative Rights Hegemony: Analysis of the UN Universal Periodic Review in the Russian Federation. Europe-Asia Studies, Vol. 70, Issue. 4, p. 638. Minami, Daisuke 2018. Lost in translation: Problematizing the localization of transnational activism. European Journal of International Relations, p. 135406611879483. Davies, Thomas 2018. The Blackwell Encyclopedia of Sociology. p. 1. Almeida, Paul and Chase-Dunn, Chris 2018. Globalization and Social Movements. Annual Review of Sociology, Vol. 44, Issue. 1, p. 189. Knüpfer, Curd B and Entman, Robert M 2018. Framing conflicts in digital and transnational media environments. Media, War & Conflict, Vol. 11, Issue. 4, p. 476. Palmiano Federer, Julia 2018. We do negotiate with terrorists: navigating liberal and illiberal norms in peace mediation. Critical Studies on Terrorism, p. 1. Camaj, Lindita 2018. Blurring the boundaries between journalism and activism: A transparency agenda-building case study from Bulgaria. Journalism, Vol. 19, Issue. 7, p. 994. Paul, T V 2018. Assessing Change in World Politics. International Studies Review, Vol. 20, Issue. 2, p. 177. Kaoma, Kapya 2018. Christianity, Globalization, and Protective Homophobia. p. 1.